at included a salary cap. In 2009, the NHL enjoyed record highs in terms of sponsorships, attendance, and television audiences. The NHL draws many highly skilled players from all over the world and currently has players from about 20 different countries. Although Canadians have historically constituted the majority of the players in the NHL, over the past four plus decades the percentages of American and European trained players have increased both because of the NHL's continued expansion from six to thirty clubs since 1967, and the increased availability of highly skilled European players. Since September 15, 2012, the league has been inactive due to an ongoing labour dispute with its players union, the National Hockey League Players Association; prolonged labour stoppages have been a recurring trend in the league's recent history. 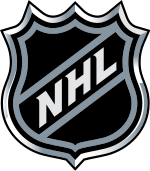 The 2012 NHL lockout is the third lockout in the league's history, with all three having occurred since 1994; of the major professional sports leagues of the United States and Canada, the NHL has lost the most playing time to labour disputes, with a full season lost in 2004–05 (the only league to have lost an entire season to labour problems). Failure to make progress in negotiations during the 2012 lockout have also led to the possibility of that season also being lost.